Exercise is as important while traveling as stopping to smell the roses. Many wonderful RV parks have gyms with stationary workout equipment for park patrons’ use. Going rustic camping or staying at a RV park without a gym, it’s time to get creative. Carrying mountain or road bikes is a great idea, but not everyone rides bicycles. Loading and unloading heavy “home gyms” is out of the question; I’m simply not going to do it. Getting out and taking a hike is wonderful exercise. If the weather is disagreeable and there’s no gym in the park, you can exercise in the RV, camper or travel trailer. Below are five exercise systems that can be carried in every trailer or camper from teardrop to the largest RV. All can be found online or in the sports department of large box stores. 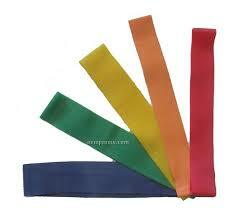 Elastic bands have been used for decades to help exercisers work muscles and burn fat. Some look like overgrown rubber bands while others require one end to be anchored to something while the user pulls on it. For teardrop owners this will mean tying it to the car or a tree. They all come with instructions and exercises for use; most have a carrying case as well. Mini-exercise cycles are interesting. 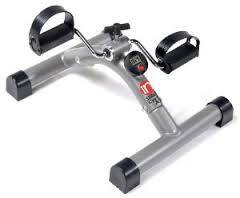 They consist of a stand and pedals with a dial that increases or decreases resistance. Simply sit in a chair and pedal away. Move the cycle and exercise the arms. It stores readily and can be used anywhere. Combine this with other exercises for a full workout. Exercise balls are great! They are quickly inflated for use and deflated after use. Together with a manual or electric pump, they weigh no more than five total pounds. Each ball comes with instructions and exercises. Books with more extensive exercises can be found online. Exercise DVDs are plentiful and easy to use. If there isn’t enough space inside, see if the TV can be moved outside and enjoy the workout of choice. Get friends together at the park for a quick exercise club. It’s far more fun to work out with others than alone. Twist boards have been around for at least three decades. It’s a Lazy Susan designed to hold a person on sturdy ball bearings. Get on, twist your body to music, and follow the instruction booklet for an easy workout. All of these wonderful inexpensive systems can be found online and in stores, so give your body and your health an advantage and get moving! I really enjoy your blogs. Thanks for providing healthy exercises, tips, and product info for those who love this lifestyle and want to continue on as long as possible on the road! Keep up the good work!